DOHA, Qatar, 2017-Aug-02 — /Travel PR News/ — Qatar Airways’ rapid expansion plans are continuing apace after it unveiled even more flights to top destinations in Asia. Today (01 August 2017) the award-winning airline added extra services to the Vietnamese cities of Ho Chi Minh City and Hanoi, as well as to the popular Thai holiday destination of Krabi. 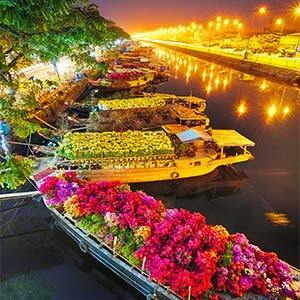 Vietnam gets a boost to meet increased demand from business and leisure travellers. Passengers will benefit from a new direct daily service to Hanoi, in addition to the existing daily flights from Doha via Bangkok, doubling capacity to the city. Ho Chi Minh City’s daily service will also increase by three flights a week to 10, with the frequency increases starting from 1 January, 2018. Meanwhile, holiday-makers will find even more flights to the beautiful Thai beaches of Krabi, from 1 December, 2017, thanks to a daily service. Qatar Airways Group Chief Executive, His Excellency Mr. Akbar Al Baker said: “The Asian market is very important for us, so we are very pleased to be able to increase our flights to Ho Chi Minh City, Hanoi and Krabi. The additional Asian flights follow the recently announced expansion of Qatar Airways’ existing service to Colombo in Sri Lanka and a new service to the Australian capital, Canberra. The frequency increases have come despite the recent GCC blockade, with Qatar Airways continuing its ambitious expansion plans and growth strategy to welcome more passengers on board to enjoy its award-winning customer service. Qatar Airways is launching 26 exciting new destinations between now and the end of 2018, including Chiang Mai, Thailand; Rio de Janeiro, Brazil; San Francisco, U.S.; and Santiago, Chile. Multiple award-winning Qatar Airways has this year alone been named Airline of the Year by the prestigious 2017 Skytrax World Airline Awards (the fourth time it has won this global accolade). Qatar’s national carrier also clinched Best Airline in the Middle East, World’s Best Business Class and World’s Best First Class Airline Lounge. The airline’s on-demand à la carte menu service allows Business Class passengers to order anything from the menu at any time during the flight. All passenger can enjoy the airline’s award-winning interactive in-flight entertainment system, Oryx One, which offers up to an amazing 3,000 entertainment options. Qatar Airways, the national carrier of the State of Qatar, is celebrating 20 years of Going Places Together with travellers across its more than 150 business and leisure destinations. The world’s fast growing airline will add a number of exciting new destinations to its growing network in 2017/18, including Dublin, Nice, Skopje, Sarajevo and many more, flying passengers on board its modern fleet of 200 aircraft. A multiple award-winning airline, Qatar Airways was recently named Airline of the Year by the 2017 World Airline Awards, managed by international air transport rating organisation Skytrax. It was also named World’s Best Business Class, Best Airline in the Middle East, and World’s Best First Class Airline Lounge. Oryx One, Qatar Airways’ in-flight entertainment system offers passengers up to 3,000 entertainment options from the latest blockbuster movies, TV box sets, music, games and much more. Passengers flying on Qatar Airways flights served by its B787, A350, A380, A319 and select A320 and A330 aircraft can also stay in touch with their friends and family around the world by using the award-winning airline’s on-board Wi-Fi and GSM service. Qatar Airways proudly supports a range of exciting international and local initiatives dedicated to enriching the global community that it serves. Qatar Airways, the official FIFA partner, is the official sponsor of many top-level sporting events, including the FIFA 2018 and 2022 World Cups, reflecting the values of sports as a means of bringing people together, something at the core of the airline’s own brand message – Going Places Together. Qatar Airways Cargo, the world’s third largest international cargo carrier, serves 60 exclusive freighter destinations worldwide via its world-class Doha hub and also delivers freight to more than 150 key business and leisure destinations globally with 200 aircraft. The Qatar Airways Cargo fleet includes eight Airbus A330 freighters, 12 Boeing 777 freighters and one Boeing 747 freighter. This entry was posted in Airlines, Airports, Business, Flights, Travel, Travel Marketing, Travel Services, Travelers and tagged Akbar Al Baker, Asia, flights, Qatar Airways. Bookmark the permalink.